It's hard to imagine a Geneva Motor Show without an out-there concept from Frank Rinderkneckt and his Rinspeed brand. And true enough, the Swiss firm will perform the world debut of the all-electric "UC? ", a concept micro car that is said to introduce a new mobility concept that integrates individual car ownership and public transportation. And what exactly does that mean, we hear you ask? Well, according to the Swiss automobile and concept car maker, the UC? features an advanced railcar loading system that allows the driver to cover long distances by train. When the owner of the diminutive two-seater decides to take the UC? for a spin, then an electric motor with 130 Nm of torque kicks in allowing the vehicle to reach a top speed of 120km/h (75mph). The Lithium-ion battery pack offers the two-seater car a driving range of around 105 km or 65 miles before requiring recharge. Being a product of Rinspeed, the UC? comes with an unconventional driving setup as the classic steering wheel and pedals have been replaced by a video-game-like joystick. As far as styling is concerned, on the outside, the 2.6-meter long UC? 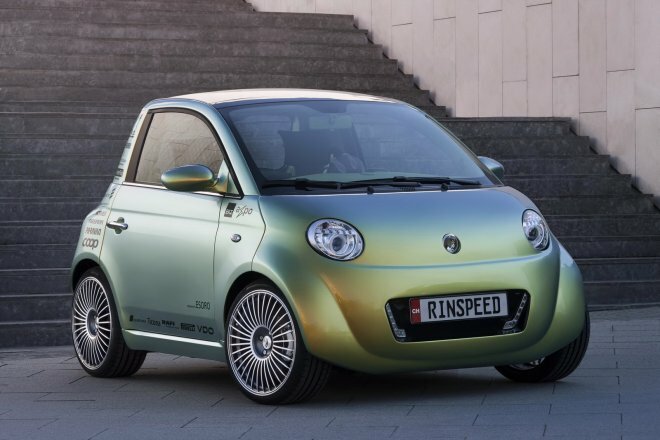 looks like a cross between a Fiat 500 and an Axiam, while the interior is even more quirkier with vivid colors and a center gauge that could inspire a new line of toys for Fischer-Price.